Slysoft's CloneDVD is an award-rewarding tool to copy and clone your DVD disc to your computer. However, Slysoft doesn't provide CloneDVD for Mac and there is no plan to develop an equivalent Mac version of CloneDVD. If you are using a Mac and want to back up your DVD movies, you need a CloneDVD for Mac alternative. If you are just looking for the best alternative to CloneDVD for Mac, congratulations! You are just in the right place now. In this article, we will show you how to copy your DVD to computer and even iPhone, iPad, iPod, etc. Here Aimersoft DVD Backup for Mac is highly recommended as the equivalent tool to CloneDVD for Mac OS X (including Mountain Lion). With it, you can copy both unprotected and protected DVD movies in your preferred copy modes: Full Copy, Main Movie Copy, Customized Copy and Split Copy. In addition, it lets you copy D9 to D9, D5 to D5, compress D9 to D5 and split D9 to 2 D5 discs. Furthermore, it allows you to save the copied files to portable devices like iPhone, iPad, iPod, etc. 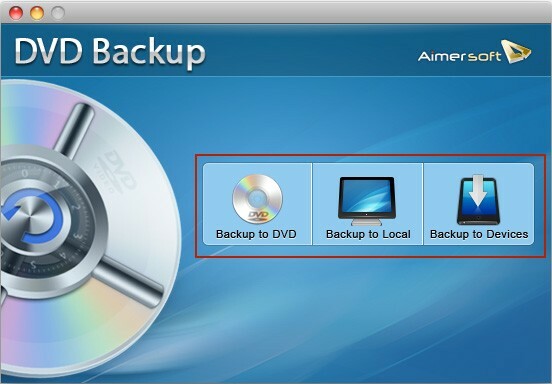 Run Aimersoft DVD Backup for Mac and choose the output style from "Backup to DVD", "Backup to Local" and "Backup to Devices". For instance, if you want to copy the DVD to your computer as a DVD folder, select "Backup to Local" and then follow the instruction to load your target DVD movies to the program. Four copy modes are provided: Full Copy, Main Movie Copy, Customized Copy, and Split Copy. Simply select the mode you prefer and then set the copy parameters like DVD name, copy speed, subtitle, audio track, etc. After all necessary settings, preview your files in the preview window to make sure everything goes as you have expected. When all is OK, click "Start" on the lower right to begin copying your DVD movies. This tool will automatically decrypt the DVD copy protection and clone a protection-free copy. I would like to be able to copy workout dvds. After copying them can you put them on a memory card to use on a tablet? I''ve successfully burned protected DVDs but I''m now getting the message "Import failed! Please make sure it''s a movie DVD and has standard DVD structure". Why is this happening? I am trying to make a copy of a workout DVD ( T25), and it keeps saying "Warning: Import failed! Please make sure it's a movie DVD and has standard DVD structure". Is there something I can do to fix this, or will this program not work for me/ these DVDs? Hi, allen. Aimersoft DVD Backup for Mac offers ten times free trial. Hi, been trying for weeks to clone a dvd to dvd without quality loss, as advertised, and it seems like all the different settings are pretty much the same codec, and they all decompress. Often i'm getting an interlace on a dvd which didn't have one... can you please advise, thanks. i heard about this software from my friend and just tried the trail version it is good , now i want to buy the full version , what is the cost the full version and where can i buy it ?? A super easy and fast Mac DVD copy tool to help you copy home DVD movies to DVD or hard drive on Mac.